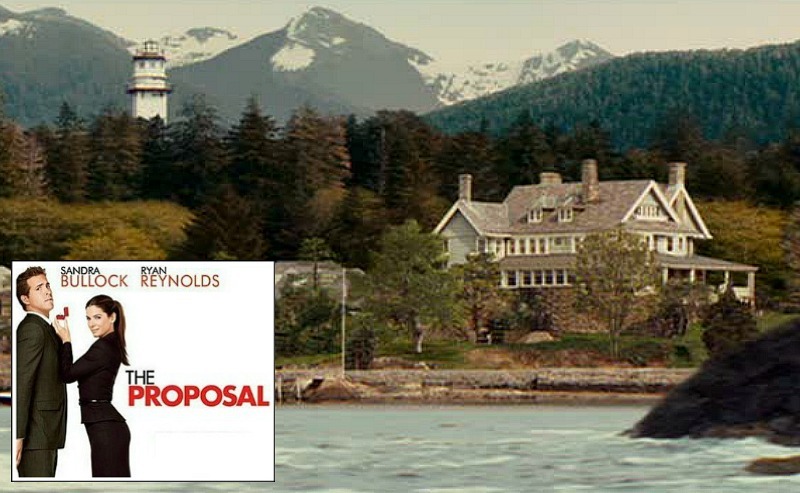 The Sandra Bullock-Ryan Reynolds movie The Proposal featured a fabulous cedar shingle and stone house in (what was supposed to be) Sitka, Alaska, but the real thing is actually located in Manchester, Massachusetts. Let’s take a look at the 9-bedroom, 10-bath house where most of the rom-com takes place. Update: I found photos of the real house, too. Keep scrolling to see it! Note: There are Amazon affiliate links in this post that may earn me commission but won’t affect the price. There were actually “other houses and brown, dead trees” surrounding the house. The mountains, lighthouse, and many of the trees were added to make things look more scenic. Fake branches with leaves were literally twist-tied to the trees around the house. Most of the scenes were shot inside the house, although some rooms were rebuilt on a soundstage for re-shoots. The real house is much more traditional in style. They thought it looked “too Colonial,” so Production Designer Nelson Coates built a facade on all of the interior walls of the house to make it looks more Alaskan. The fireplace stone, wood trim and beams are fake, as are all the walls in some rooms! We only see the kitchen cabinets in a deleted scene via the DVD’s special features. The house has 3 stories, but the top 2 were off-limits to the film crew. All of the homeowners’ things were moved upstairs, and they stayed in the guest house during filming. You can read about the Kanebs, the family that owns this house, in the NYT. The barn really exists on the property, so they decided to use it for Margaret and Andrew’s wedding. They filmed an alternate ending that had Margaret’s plane turning around, and a happy ending on the tarmac. They used an empty, gutted building in Boston for the earlier office scenes, but the entire set, including Margaret’s & Bob’s offices, had to be completely rebuilt and replicated at Disney Studios in Burbank, CA for the rewritten ending. The puppy Kevin was played by four American Eskimo puppies named Flurry, Sitka, Nanu and Winter. You can read about how they transformed the town for the movie here. I love Sandra Bullock and her movies. The Venice Canal Bungalow in "Because I Said So"
I loved that house! Great post! .-= Jessica at Lavender and Lilies´s last blog ..Change Change Change =-. .-= Jess @ Frugal with a Flourish´s last blog ..Reader Project- Wedding Centerpiece Wine Bottles =-. I immediately starting googling this location after seeing this DVD for the first time. I was somewhat disappointed that it wasn’t really Alaska, but they did a wonderful job of making it look as authentic as they did. Great movie! Thanks for the extra details. .-= Jennifer´s last blog ..Tex-Mex Chorizo Migas =-. I LOVED that movie and the house too. Thanks for posting this. .-= Suzann´s last blog ..A Trip around the Kitchen =-. Every time I read one of your movie posts, I want to go and rent the movie ASAP! Thanks for the insight. .-= Vanessa@decor happy´s last blog ..Fun- Rest and Sadness =-. .-= Janell Beals´s last blog ..This Weeks Ideabook On Houzz- Mixed Company =-. I adored the house in this movie! And the lovely little coastal town. .-= Juju at Tales of Whimsy.com´s last blog ..News Flash- Im gonna knock you out =-. Your Welcome! I’m always glad to help. I love this house! It’s gorgeous. I wish they had spent more time capturing the house in the movie. Then we could have seen better views of it. Too bad those mountains aren’t real. There’s movies I love watching over again for the houses too. Like Matilda and Swiss Family Robinson. Too bad most of the homes in movies aren’t real because then I can never live in them. If only someone would draw up some houseplans for the movie houses. This movie was so much better than I expected it to be, and I’m so glad you did a post on it. I loved the house. When they first come around that bend and the house comes into sight, I had a sharp intake of air — it was so breathtaking. I’m shocked (but not surprised?) to learn that it was filmed in New England. I’ve lived in both Connecticut and Maine, and I thought the town and the area shown in the movie were charming, but I never would have guessed they were in the Boston area. Well done, movie people!! Loved the movie, loved the house, loved this post and loved finding out it was really in Mass. I like surprises. .-= Mom in High Heels´s last blog ..RTT- Building Legos in my dreams =-. I’ve always been so curious about the movie magic that takes place to change houses like this. It’s so amazing the things they can do! The house looks completely different in the movie. The NYT article on this family was really good too – they are really lucky their kids talked them into letting them film at the house because it sounds like a great experience. I’d love to have Betty White at my house for two months! Oh my gosh, I absolutely LOVED this house when I watched this move! How interesting the changes the set designer people can make. I like the “after” shots much better than the “before”. I’m surprised the owners didn’t leave the changes! Great post, I’ve been hoping you would do this one. That fireplace is a dream! I’ve never seen the movie, but I will definitely now! I live right outside of Boston, but I don’t remember it shooting here (there are lots of movies shooting here lately!). I’ll have to take a ride up to Manchester to see it! Thanks for another fascinating post, Julia! .-= Becky @ Farmgirl Paints´s last blog ..The list =-. I didn’t like the film, but I did adore that house, it was just beautiful! .-= Liz@VioletPosy´s last blog ..3 Today =-. I also love Julia Roberts, but don’t think it would have been as funny with her in that role. .-= rhianna´s last blog ..Cats House DC Housewives =-. Great job. That’s a ton of work on your part to put that together-thank you it was fun to see. I heard that Sandra’s acting was way better in this movie than the Blindside and that she really should have won the award for her performance in the Proposal. That would not go over well as it was a comedy but I thought she was fab. My sister had a commercial shot at her home-it is crazy disruptive. Love that movie and love the house! Can’t believe it is in Mass., I might have to talk the husband into driving to Manchester to see it, although he will probably think I’m nuts. The bedroom is by far my favorite room, if I could have those blackout shades and fireplace I think I would be happy, and if they threw in that gorgeous bathroom I would be positively delirious! Oh someday. .-= hip hip gin gin´s last blog ..Welcome! =-. I love this house and this movie! .-= Blakely´s last blog ..QBQ =-. Great post! I saw the film…and watched the behind the scenes…but am happy you shared all the “extras.” Thank you! .-= Kelly, Arte Styling´s last blog ..Color in Food Development – Interview with a Food Scientist =-. Finally! lol, jk. I love this house so much! And on second read/look, I actually noticed the backsplash in the kitchen which I LOVE. I’m not a huge fan of the cabinets though. I love learning all about the movie magic. It’s amazing that they would choose a house and then completely rebuild the inside. It seems like they would just choose a different house. .-= Lesley @ TheDesignFile´s last blog ..Design Star- Elimination means curse continues =-. .-= Amanda @ Serenity Now´s last blog ..A Major Award =-. .-= Trish @TheOldPostRoad´s last blog ..Cades Cove =-. I LOVE that you posted this house! 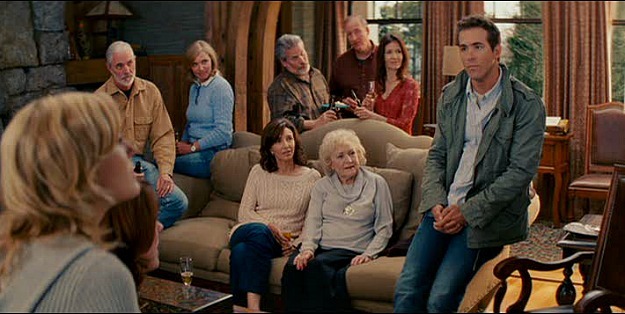 I fell in love with the house watching (and re-watching) The Proposal. The archways, the bathroom, the gorgeous bed, and of course the Babymaker quilt! 🙂 Fantastic post thank you for sharing! They did a good job with this movie, but for me, this house totally stole the show! Very interesting that it was actually in MA. .-= Struggler´s last blog ..More Decorating with Dogs =-. I loved this movie too Julia, but didn’t realize that it’s actually in MA and not Alaska like the movie implied. Now I’ve gotta check out your post about Sandra’s new Victorian home in New Orleans. I luv everything about Sandra…I’m a big fan. .-= Marie´s last blog ..Illuminate Your Space =-. I just love movie houses! How many of us love some of the movies just because of the houses?? I just thought of a great question to ask your readers: What movie house would they build if they had the money? I already have my answer. Which one would you build, Julia? Well, since I too have a love affair with houses of all sorts, I’m pretty much in the same boat as you! But, currently I’m crazy about the home belonging to Cameron Diaz in the movie, “Holiday.” I must say though that I also love the home in “What Lies Beneath” or the Grey Garden house is architecturally pleasing also! I love your choices too . Love Movie Mondays! I seriously look forward to it all week…end? I have to say, I liked this movie OK, but I wasn’t SUPER impressed by it. I remember loving the landscapes more than I noticed the house, although I like what I see from these pictures. I think that’s because I’m from Seattle so I am naturally drawn to that Pacific Northwest coastal vibe 😉 AND those bright green/teal cabinets are a shock! But I really like them! .-= Kate (Little Beach Bum)´s last blog ..Hidden Rules =-. I loved this film, and can not imagine Julia Roberts in the lead!! .-= Catherine´s last blog ..Coffee Flavored Coffee =-. Ahhhh – thanks for doing this one. In the future, if you just want to review Ryan Reynolds’ movies exclusively… that would be fine, too. .-= Lauren´s last blog ..Now with floor =-. i loved this movie too! i laughed my heart out when i watched it! I do not understand why they spend all that money to film at a huge place, change everything or almost everything, and then give us almost no view of the place. Old movies spent more time with the camera steady or not as many closeups and you got a much better view of the place the story was happening. This is one of my favorite movie houses. I love the outside. I also love Sandra Bullock and Ryan Reynolds in it. I enjoy Julia’s movies too, but I’m glad Sandra was in this one. It worked really well. .-= elz´s last blog ..Friday Favorite- Shark Christmas Ornament =-. Does anyone know what the name of the boat is in the moie? Love those cabinets in the kitchen!! I love reading through and looking at all your wonderful work, I must admit I loved the movie but even more so I love that bed!!! Does anyone have any clue as to where it’s from? I have gone almost crazy trying to figure it out, thanks and as always enjoyed the amazing pics! 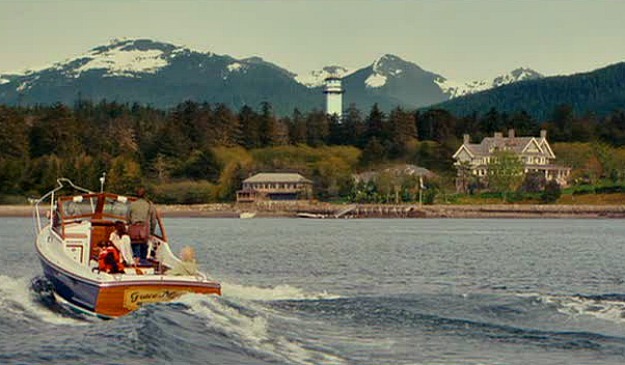 It’s a very nice house and a good movie aswell, but i was born and raised in Sitka and they should have found a house to film in, in sika, I was totally upset with that! !